Controlling the contaminant flow of your hydraulic, lubricant or fuel reservoirs is one of the simplest goals in achieving Total Systems Cleanliness. Fluid contamination is the root cause of most hydraulic system failures and, while most systems today use oil filters, it is not uncommon for airborne contamination to go overlooked altogether. To prevent airborne contamination ingression, Hy-Pro offers a line of breathers that help reduce strain on system filters to extend the life of your fluids and protect your critical components. Controlling solid contaminant ingression with Hy-Pro's high capacity, high-efficiency pleated glass elements couldn't be easier. Our spin-on breathers combine ease of installation and adaptability to prevent airborne contamination and extend life for the other filters in your system. With common threaded and bayonet style adapters, and numerous media options, spin-on breathers are a quick way to replace ineffective filter and breather caps right out of the box. The same Hy-Pro Dualglass you trust to remove particulate contamination from your hydraulic and lube oils pulls double duty in the BF breathers by removing airborne contamination from incoming air as your reservoir levels change. 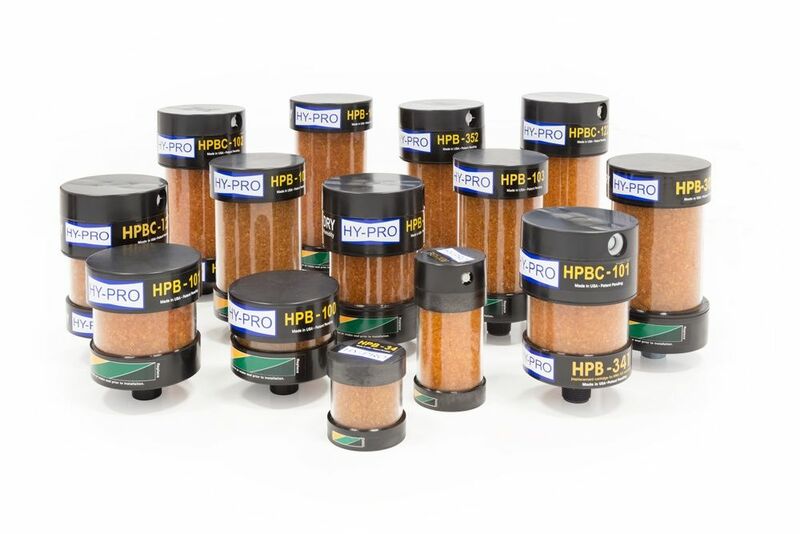 Designed to withstand the constant flexing of hydraulic systems, Hy-Pro filter media is the hands-down best at capturing and preventing contaminants from ever entering your system. BF Breathers are equipped with tattle-tale gages that capture the maximum vacuum level caused by rising and falling fluid levels to let you know exactly how your system is operating. Whether you're operating reservoirs with huge cylinder return flows or large extrusion presses, BF Breathers offer the perfect fit for your system. And with numerous standard connections, you can set yours up straight from the box, no adapters needed. Atmospheric moisture is a continuous threat to the efficient operations of your equipment and machinery Hy-Pro's Hy-Dry breathers use high capacity silica gel to remove water from the air before it can ever enter your equipment, helping to prevent fluid breakdown. As Hy-Dry breathers absorb moisture from the air entering your system, the gold silica gel will change colors to let you know it's working effectively and even give you a reminder of when it's time to replace. Each Hy-Dry Breather is equipped with an internal 2-micron particulate filter on both ends of the silica chamber to protect your system from airborne contamination. Additionally, exhaust from your reservoir flushes the trapped particulate from the outer filter and back into the atmosphere, making Hy-Dry a self-cleaning powerhouse for contamination prevention. Select models come with dual check valves to prevent outside moisture from entering. They come in a variety of sizes, connectors and other options designed for countless applications. Using any of the Hy-Pro Line Breathers filters in conjunction with more robust particulate filtration helps to protect your uptime, critical hydraulic and lube assets, and fluid life. So, if you are looking for a simple place to start your process of Total System Cleanliness, then start here. Let Hy-Pro's line of breathers help you create a clean, healthy, and reliable hydraulic, lubrication or fuel system. See how this upgrade led to a substantial improvement in ISO fluid cleanliness codes in a high-pressure hydraulics system at a steel mill.